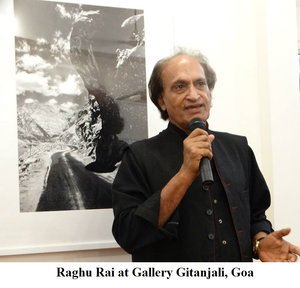 Himalayan Insights was India’s foremost photographer Raghu Rai’s contribution to Goa Photo 2015, an annual international photography festival. A collection of photographs selected from work done over the years in capturing shots of the Dalai Lama and places such as Ladakh and Gangotri, made a startling impact on the viewer in their black and white avatar. Impressive in their depth, the photographs were lent an aura of poignancy with the lack of rainbow hues. ‘Images should have their own strength about them. They should be able to stand on their own. Some of them were in colour but colour is pretty and predictable. Too many photographs appear as picture postcards with colour,’ says Mr Rai, explaining why the entire collection was in black and white. Raghu Rai qualified as a civil engineer but took up photography in 1965, going on to take up his first job as a photojournalist at The Statesman the very next year. He left his employment as chief photographer at the newspaper in 1976 to join a weekly news magazine in Calcutta called Sunday. In 1980, he went on to become the picture editor-visualiser-photographer for India Today during its formative years. Rai’s exhibition at Gallery Delpire, Paris, in 1971, allowed him a nomination to the world’s premier photographic cooperative, Magnum Photos, after his work was duly noted by world famous photographer Henri Cartier Bresson. He is the only photographer to receive one of India’s highest civilian awards, the Padmashree, for his photographs covering the pitiful state of Bangladeshi refugees, the course of the Indo-Pakistan War of 1971 and Bangladesh’s subsequent independence from Pakistan. His fascination with the country of his birth and determination to project her mysterious faculty of holding in her embrace a multitude of cultures, religions and languages, is well brought out in numerous books such as Khajuraho (1991), Taj Mahal (1986/87) and The Sikhs (1984). His is a rare choice in a career in photography, of eschewing world travel to enhance his repertoire in favour of concentrating entirely on India. He refuses to be one of the herd and the students at the Raghu Rai Center for Photography are encouraged in the same strand of thought. They are not just taught the technical details of photography but stoked to discover their inner genius that will set them apart in a world where most photography, albeit pleasant to the eye, struggles to rise above the mundane. Raghu Rai’s photography travels beyond mere representation of substance. He brings to us every emotion hidden in a situation. A true master of his art, his endless passion and matchless experience do indeed make him India’s greatest photographer and one of the best in the world.